HUBER+SUHNER has developed the NEX10™miniature coaxial connector solution for smaller sized equipment in the telecom market. With a robust design for outside use, low PIM, and a small flange height of 12.7 mm, these connectors are ideal for a variety of applications including small cell, MIMO, DAS/in-building, antenna systems, radios, multicoaxial, and blind mate uses. 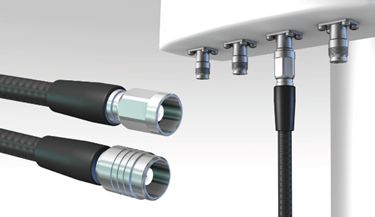 The NEX10™ series of connectors is optimized for ¼” flexible cables. Operating frequency ranges are available up to 20 GHz with excellent RL and electrical performance. Additional features include three options for coupling mechanisms, rubber boot weather protection, and flexibility in installation. For additional information on the NEX10™ miniature coax cables, download the brochure or check out the video below.